It is no secret that the reward of caring for young children in your home comes with some risks. As a family child care provider, you open your door every day to young children and their families, but you also open your door to many of the risks associated with doing business in your home. Having a sound risk management plan in place will allow you to keep the children in your care safe, healthy, and happy and protect you and your business…. Begin your risk management plan with a directory of important contacts—the names, addresses, and phone numbers you may need in case of an emergency. Include yourself, assistants and substitutes, 911, poison control, state licensing agency, health department, landlord, plumber, electrician, the water department, and a neighbor. Post this information in your home along with the current phone numbers for parents and at least one local and one out-of-state back-up contact for each child. Have a portable copy of contacts and emergency information including children’s medical and allergy conditions available to take with you anytime you leave the house. The next step in creating a risk management plan is to generate a list of the specific risks your family child care program is vulnerable to. Think about the risks that are unique to your location and the population of families you serve. Consider contacting your local Red Cross to learn what disasters are likely to occur in your area and how to best prepare. The National Association for Family Child Care (NAFCC) encourages providers to think about four major categories of risk: injuries to children, damage to property, lawsuits, and car accidents. Think about your program and create a list of potential emergencies and risks that need to be addressed in your risk management plan. After you have created a list of potential emergencies, you can begin writing your risk management plan. According to the Business Administration Scale for Family Child Care, a risk management plan should include clear procedures to follow in the event of an emergency, guidelines to reduce the risk of child abuse or neglect allegations, steps to maintain the safety of people, property, and equipment, and procedures regarding the release of children. Use these four categories as a guide for creating your risk management plan. Procedures to follow in the event of an emergency. This section should contain all of the potential program risks you identified in step 2. Situations might include a fire, tornado, hurricane, earthquake, flood, power outage, vehicle accident, lost or missing child, and the injury of child, parent, or staff member. For each emergency situation, create specific procedures that clearly identify what steps are to be taken. Be sure to include evacuation and sheltering procedures and communication guidelines for notifying parents and authorities. Time is critical during an emergency so keep the information simple and easy to read. Guidelines to reduce the risk of child abuse or neglect allegations. There is no faster way to shut down a family child care program than with allegations of abuse of neglect. Here you will identify the ways to reduce the likelihood of being accused of child abuse or neglect. This is more than having a policy stating that you are a mandated reported because the goal of this section is to prevent allegations against you or your program. Policies in this section may include an open-door policy stating that parents are welcome to visit at any time, maintaining daily sign-in and sign-out sheets, the use of accident reports, and conducting daily health checks. Procedures to maintain the safety of people, property, and equipment. Procedures to maintain the safety of people, property, and equipment may include policies about universal precautions, hand washing, sterilizing toys, the annual replacement of smoke alarm batteries, and servicing of fire extinguisher. Don’t forget to include your outdoor play area as well with policies and procedures to make sure the area and equipment are clean and safe. Procedures regarding the release of children. Most programs have procedures they follow regarding the release of children; however, a lot of programs neglect to put those procedures in writing. 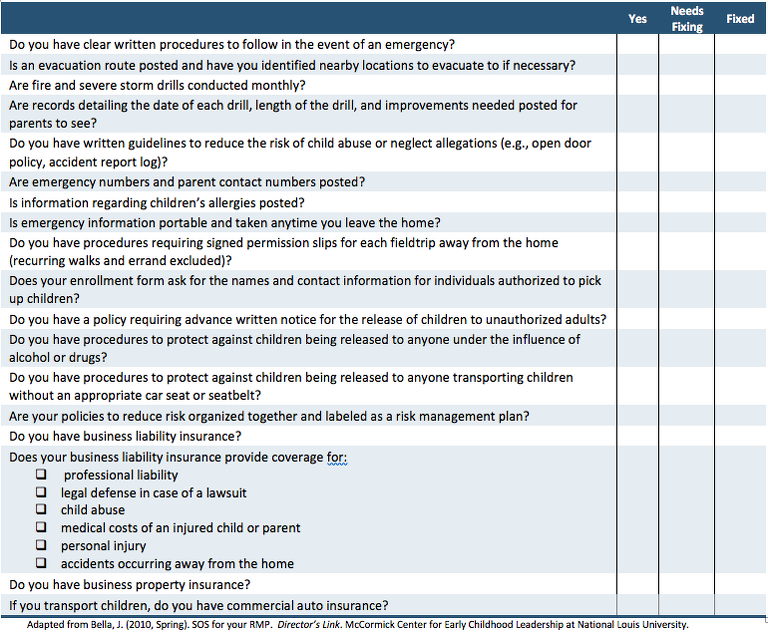 When you are working on this section of your risk management plan, make sure you include all of your policies concerning who is authorized to pick-up children, the requirement of advance written notice to add a new person to pick-up authorization, and your procedures for checking identification when an unfamiliar person picks up a child. Also include any policies and procedures you may have that protect children from being released into potentially harmful situations. Examples of this might include procedures to protect against children being released to anyone under the influence or transporting children without the appropriate car seat or seatbelt. These can be tense situations and you may find it helpful to define how you will respond if such a situation occurs. Be sure that these procedures are in writing and have been shared with parents ahead of time so that if a situation occurs everyone is clear on how you will respond. Having clear policies and procedures in writing is only half the battle, if you want them to be effective you have to implement them. One of the first steps in implementing your new or updated plan is to share it. Making sure all the adults in your program (parents, assistants, volunteers, and your family) are familiar with your risk management plan will help you to smoothly implement your policies and procedures, especially if a real emergency occurs. A risk management plan is not a static document. As the year goes on you may find that updates and additions are necessary. Additionally, it is a good idea make a habit of reviewing your full plan once a year. Ask the adults in your program to review it with you and make sure that you date your review and revisions so that you have a written record of when changes were made. Evaluating your ability to minimize risk and/or respond to disasters can help improve your success in those situations. Take a few moments to complete the following checklist. In addition to having a risk management, protect yourself and your business by purchasing the appropriate insurance. If there is a flood in your basement and you have not shared with your insurance company that your home is also used for your business and purchased insurance specifically to protect it, there is little guarantee that your homeowner’s insurance will cover you. The best way to protect yourself and your business is with comprehensive business liability insurance and business property insurance. Comprehensive business liability insurance should provide you with coverage for professional liability, legal defense in case of a lawsuit, child abuse, medical costs of an injured child or parent, personal injury, and accidents occurring away from the home. If you are transporting the children in your care, you should also look into commercial auto insurance to make sure you are covered in case of an accident. Although insurance policies can be difficult to understand your best bet is to be honest with your insurance company, ask as many questions as you would like, and do your research to make sure you get the best coverage that you can afford. As a family child care provider, you spend many happy hours caring for children in your home, but in doing so you are also opening yourself up to the risks associated with running a business in your home. One of the best ways you can protect yourself and the children in your care is to develop and implement a written risk management plan. Having clear written policies and procedures in place will not only help reduce the likelihood of an accident occurring but will also help minimize the damage should a crisis occur. Adapted from Steffen, P. (2010, Spring). SOS for your RMP (Risk Management Plan). Director’s Link. Wheeling, IL: National Louis University, McCormick Center for Early Childhood Leadership. Robyn Kelton is a trainer and national reliability anchor for the Business Administration Scale for Family Child Care (BAS) at the McCormick Center for Early Childhood Leadership at National Louis University. For more information about the BAS or training opportunities contact Robyn at Robyn.Kelton@nl.edu or click here to learn more. Copeland, T., & Millard, M. (2004). Legal & insurance guide. St. Paul, MN: Redleaf Press. Talan, T. N., & Bloom, P.J. (2009). Business administration scale for family child care. New York, NY: Teachers College Press.